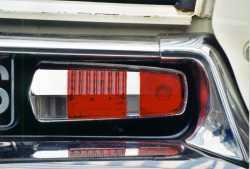 This page gives an overview over the rear light units that were used on the DS and ID berline. 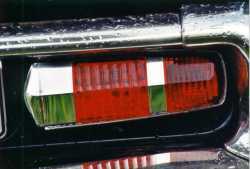 Not considered here are the quite different looking rear lights that were mounted on Slough build cars, on cars build for export to the USA and the rear lights of the break and the cabriolet. 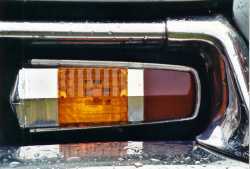 Although there were only two really different types of rear light used during the complete production time, 11 different part numbers (see table 1) can be found in the parts books for the rear light covers. 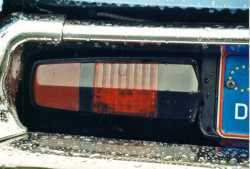 At the same time at least 12 (see table 2) different looking rear light covers can be found on the different DS and ID models. Unfortunately the parts books hardly mentions a word about the differences between the covers, so it is difficult to assign the different part numbers (table 1) to the different rear lights (table 2), apart from the obvious difference between the Pallas and the non-Pallas model rear lights and the obvious change in the overall design of the rear lights in april. 1970. (D) means Germany, (I) means Italy. Brake stands for brake light; pos. stands for position light. The red text in the table above is my "theory", it is not said that this is correct !! On very early DS19's the black part of the light cover (this covers the number plate light) is made out of metal, this in contrast to all later models where the light cover is completely made out plastic. I think that this early light cover has part no. 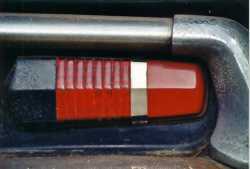 D544-4, it is easily recognized by the small "silver" strip between the tail light and the brake light. Somewhere in 1956 or 1957 there must have been a change to the all plastic cover that is shown in the second photo below. 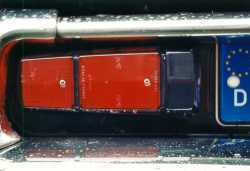 I think that this was DM544-4, note that the small silver strip has dissapeared. 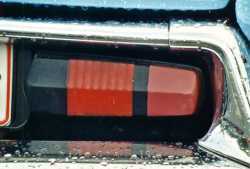 For the period from march 1964 to january 1967 the D's build for export to Germany had rear light covers (DS544-4a) that were different from the "normal" cover, it's not clear in what aspect they were different. In september 1964 the DS Pallas was introduced. The Pallas allways had a "silver" instead of "black" housing. Again there were different covers for Germany (and Italy). 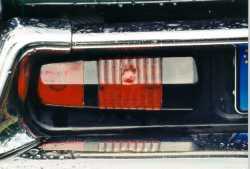 As far as I know the covers with the red brake light were for Germany (and Italy). 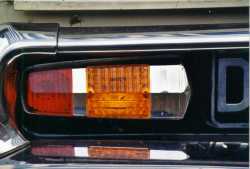 Pallas'es for all other countries had orange brake lights. There was a totally unclear change from DS544-4c to DS544-4d somewhere between 96/64 and 1/67. Before january 1967 the position light was smooth (not structured). There are clearly two or even three (for the non-Pallas) versions of the smooth position light, a matt pale version (non-Pallas only), a matt version and a clear version (see the 2nd, 3rd and 4th photo in the left column as well as the 1st and 2nd photo in the middle column of table 2). I guess that the clear one is the later version, but it seems that there was no part number change. In january 1967 there is a change from DS544-4x numbers to DX544-4x for all three types (normal DS&ID, DS Pallas and DS-Pallas for Germany) of covers. 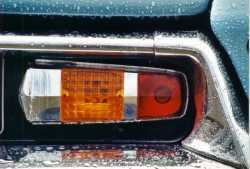 That must have a reason, my guess is that at this time the structured or rippled position (or tail) light was introduced (see the photo's below). 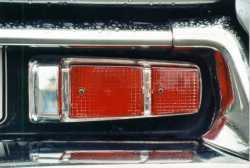 In march 1969 all Pallas's got the same rear light covers, I think that this was the version with the red brake light that until then was only used for the German (and Italian) version. In april 1970 the rear light units (for both non-Pallas and Pallas) were completely changed, see the photo's in the last row of table 2. There were no special versions for special countries anymore. As already mentioned above the explanation for the different part numbers as given above is just my "private theory". I'd very much like to hear to expertise and opinion of other people on this subject ! !